Even though snacks such as tortilla chips are gaining popularity, the high intake of these products may cause problems related to their fat and acrylamide content. 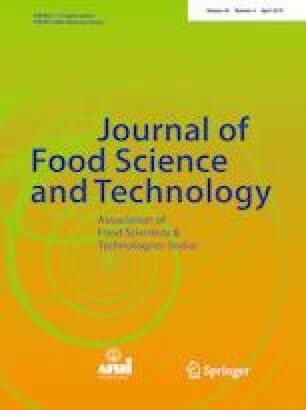 In consequence, this study is aimed at evaluating the effect of pre-fry drying on the absorption of oil, physicochemical characteristics and formation of acrylamide in corn tortilla chips fried in ten batches. Pre-drying was carried out at 40 °C, 50 °C and 60 °C and two air velocities (1.0 m/s2 year 1.5 m/s2). Frying conditions were selected from pre-tests where the physicochemical variables of frying oils (palm olein and avocado oil) were measured. Acrylamide content was measured by GC–MS analyses. The results revealed that the type of oil did not show a significant effect on the physicochemical variables studied. Pre-dried chips showed a decrease in the final oil content of 41–58% (depending on the type of oil used) when compared to two brands of commercial chips. All the detected acrylamide concentrations on the samples were below the detection limit (20 μg/kg). According to our results, avocado oil may also be an option for producing corn tortilla chips. The authors wish to thank Mexican Consejo Nacional de Ciencia y Tecnología (CONACyT) for the financial support given for the research subvention of Ms. M Uscanga-Ramos and M. William Bevalet for the grammar revision of the manuscript.